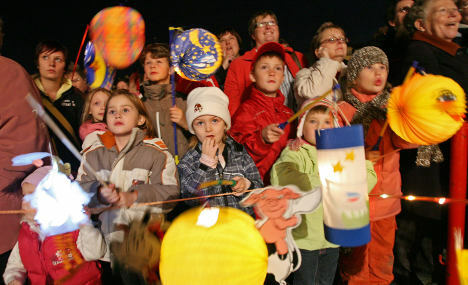 Tomorrow, on the 11th of November, children in every city and town in Germany will wander through the dark streets with lanterns (which they often made themselves at school) and sing songs. These small parades are often led by a man in a roman uniform riding a horse. The parade usually ends somewhere with a bonfire and the children are given a treat. Sounds good, right? But why do they do this? St Martin’s Day is a celebration of a roman soldier – der Heilige Martin von Tours (the holy Martin from Tours). St. Martin lived from 316 to 397 BC and was later promoted to the third bishop of Tours. The most famous legend about St. Martin tells of a cold winter’s day when he was riding through the streets and saw a homeless man shivering. St. Martin took his coat and cut it in half, giving the homeless man one half and saving him from freezing to death. This is who we remember on this special day.